Old Wilsonians v New Ash Green - Away, with the coin spinning for New Ash Green this week, they took to the field for a reduced overs match and in a persistant light drizzle managed to contain OW to 142-7. Three wickets apiece for F Quantrill & M Bushe. In difficult conditions, with good spirits New Ash Green showed they can be competitive in this league. With 2 league games this weekend & early season availability, no match was scheduled for today. There will be a Sunday fixture next weekend. Kent Regional League Match - reduced to 32 Overs. Old Wilsonians (9pts) 142-7 (32 overs); New Ash Green (18pt) 144-6 (29.1 overs); New Ash Green won by 4 wickets. New Ash Green travelled to a wet & not so wild West Wickham for their first away game in a new league. Moist with anticipation at a new venue, New Ash Green were pretty much in full attendance before an OW representative appeared, clearly someone who had checked the weather forecast before heading to the ground in a hurry. A delayed start of 32 overs, 8 over max per bowler, was agreed due to the steady drizzle which afforded the visitors the opportunity to huddle in a doorway and make small talk whilst mulling the conditions over. The standing around was preceded by the obligatory wander to the square which provided an inside view of the short boundaries with batsmen licking their lips in anticipation and bowlers trying to measure up the longest boundary to save their economy. New Ash Green won the toss and opted to field first, with Quantrill (Felix) & Syed opening the bowling; Quantrill bowling well, up the slope, in the wet conditions with Syed tight from the other end. Quantrill was the first to strike with Ives junior (James) taking a smart catch. Syed perhaps could feel hard done by not to get his name in the wickets column, as the batsman offered up a chance early on which went begging. Quantrill bowled well for his seven over spell picking up another couple of wickets, one a catch behind the pegs and the other clean bowled. Syed bowled well in his first spell albeit wicketless, but tight overs kept the score low and batsmen honest. Gallagher replaced Syed and returned a wicket, clean bowling the dangerous opening bat that looked promising for his 23. Ives senior (Martin) replaced Quantrill up the hill and provided a chance for the slips which went begging, a thick edge of the bat which never carried in the damp, heavy conditions. 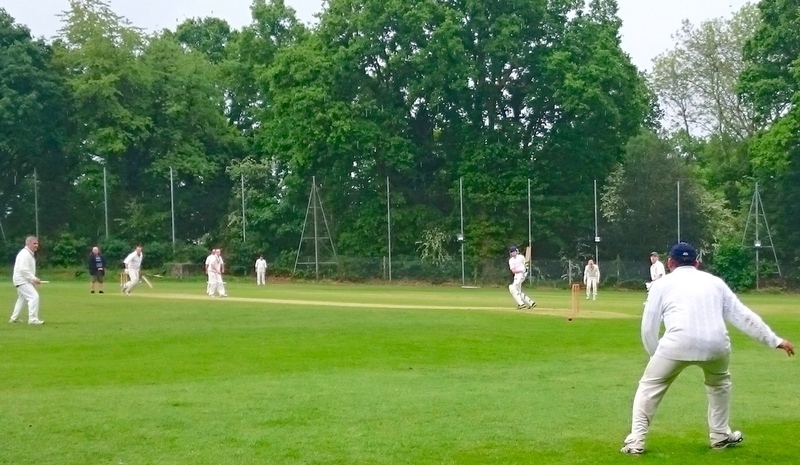 Ives continued to bowl well in tricky conditions but the batsmen were looking to consolidate the situation and didn't give up too many other chances. Bushe took over from Gallagher at the more favourable end and looked decent in his spell, with batsmen struggling to get him away to the boundary with any regularity. Bushe picked up three wickets for his efforts, the highlight a smart catch from Ives snr, leaping high to his right, parrying the ball and gaining control at the second attempt, much to the delight of the watching crowd, who had travelled over from a rained off game nearby. Returning bowers Gallagher & Syed went through the remaining overs from the other end, but struggled to pick up wickets, with the batsmen looking to hit out a bit more and take chances running between the stumps. A few tight run out chances came and went, with a special mention to the not-out batsman stranded on 30, who hit the ball well and found the boundary well with some big hits. He was assisted well by the number 7 batsman who batted smartly for his 21 and hung around for a decent partnership. Tea was kept in the kitchen as a straight turnaround was agreed in order to get the game to a conclusion and beat the weather. Opening bat Jones was welcomed to the crease with a shoulder high full toss which he gladly despatched to the boundary for four and the New Ash Green account was opened. The opening pair were looking set when Jones fell, clean bowled with 40 registered on the scoreboard. The New Ash Green batsmen all got decent starts but given out before really posting a large score, the next two batsmen given LBW. It was the partnership of Bushe & Purohit which really cemented the New Ash Green position in the run chase. A mixture of styles from the two batsmen on display complimented each other and was exactly what the game needed. Bushe more circumspect and belligerent at one end with Purohit swinging like a rusty gate at the other proved a strong pairing with them scoring runs at a regular pace, rotating the strike as often as possible. Bushe eventually fell caught behind by a very smart catch. He was replaced by Syed who partnered Purohit well, scoring quickly and taking the attack to the bowlers. After a quick fire 13, Syed was out and Ives (J) came in as a quick foil to the Purohit sharp hitting, and ran home the winning runs. Purohit can be very happy with his 31 not out, coming in at 6, putting the bad balls away to the boundary, and having a swing at the good balls. How the bowlers never managed to hit the pegs with a full & straight delivery will remain a mystery to all involved, but provided great entertainment to those congregated in the scoring hut watching from behind square of the wicket. Amongst the 31 were some lusty blows, but also good running. Everyone contributed with the bat to what looked like decent bowling. Unfortunately for the bowlers, anything outside of the stumps was in danger of being sent to the short boundaries by the batsmen, and this was the case for the New Ash Green opening pair who scored well, putting the foundations in place for a win. Not many chances were put down by OW, and a word on what would have been an excellent catch by a fielder diving to his right, sadly just missing his mitt. The fielder did well to react as quickly as he did, and to register it as a drop would be grossly unfair. Many thanks go to our hosts for having us for a decent day's cricket played in good spirit with no controversy or issues - we look forward to welcoming them to Manor Field in the reverse. (I hope they find us ok, as from the conversations with them in the bar after, I am not sure they know who we are or indeed where we are.) Special mentions to Michael James for umpiring for a full stint in the rain carrying an injury, sadly we were deprived of the opportunity to reward his hard work with a pint in the bar; and Anna for taking over the scoring as Felix foolishly though he would be required to bat. Thanks also to the OW umpire and scorer for their hard work and endeavour during the day, always appreciated. It was good to see a strong 2nd XI working hard and playing with a good team spirit all day. A relaxing tea was had after the game with some drinks for the non-drivers in the group. I think we can look forward to some more fun away-days in London. A final word goes to Felix, who I hope is home in time to read this after his long drive back from the big smoke. Manor Field. 2nd XI enjoying refreshing conditions. You can see more photos of club games here in our gallery.